a) send SMS from telephone number belonging to the chosen district code to WED telephone number in Moscow, Russia. To do it first send email with link to your Facebook page to info@gov.world. You will receive reply with WED telephone number and code word or number to send. It will cost you according to your mobile provider's tariffs for SMS to Russia. b) send message containing link to your Facebook page by Telegram internet-messenger from an account associated with telephone number belonging to the chosen district code. The WED Telegram-address for nominatory message is TheWG. Direct link: http://telegram.me/TheWG. You can install Telegram on your device or use web-version: http://web.telegram.org. It's free. NB: Please use Telegram-account without nickname for WED could see the telephone number and could be sure that your phone is in corresponding numeration zone. You can additionaly announce nomination on The World Government Facebook page. Nominations will be received till 24:00 UTC of the last day of the month after there become more candidates in district than deputies to elect there. Not more than one nomination from the same telephone number is accepted. Nomination of a person without consent banner (or line) in Facebook will be declined. WED will register (or reject) candidate within 48 hours after nomination, provided above mentioned conditions are fulfilled. 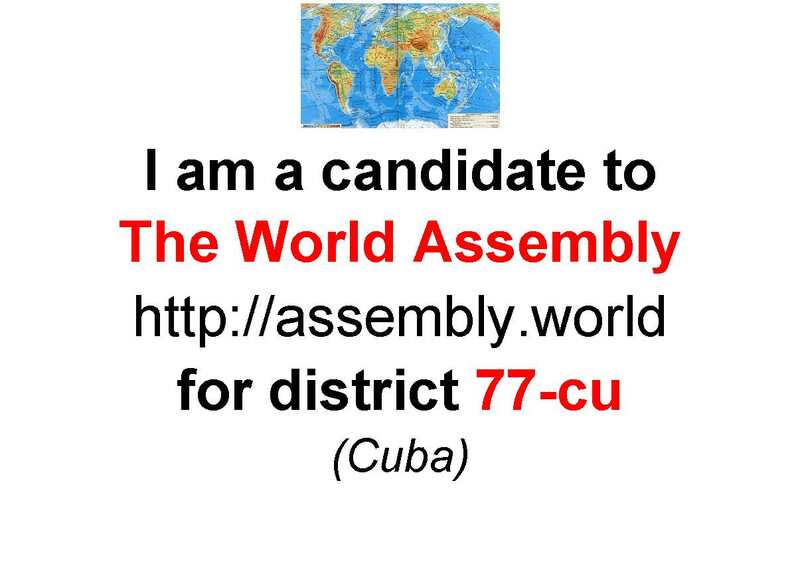 After registered, candidate cannot change the district. He/she can withdraw his/her candidacy, but cannot be nominated again in the same or other district. In case of any troubles with nomination process report to info@gov.world.